Axel Verhauwen has dealt exclusively with IP litigation for 20 years. He initiated the first standard-related infringement cases in Germany before the Dusseldorf District Court on behalf of the MPEG-2 pool, which became the first landmark decisions with respect to standard-related infringement and fair, reasonable and non-discriminatory issues. In the last 10 years he has managed hundreds of standards-related cases with respect to MPEG-2 video, MPEG-4 audio, 3G and 2G. He also deals with a wide variety of technical fields, including power plants, wind energy, automobile technology, stents, software and general mechanics. He belongs to a select group of leading IP litigators in Germany who are under 50 years old. His experience also extends to litigation relating to trademarks, unfair competition, drug advertising and pharmaceutical law. 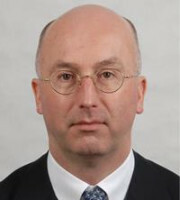 Following his studies in Germany and abroad and immediately after he was admitted to the Bar in 1996, Dr Verhauwen started to focus on patent law at Krieger Mes. He became a partner of the firm in 2003. He is the author of a chapter on Section 14 of the Patent and Utility Model Act in Commentary on Patent and Utility Model Act by Peter Mes.